I've collected a selection of animated email icons you may like to use in your blog. These images are all free to use, all I ask is that you don't link directly to the images on my server! Instead, you should download the images to your computer and upload them to your own image host instead. To download an image, right click and choose "Save image as..."
Bloggers often wish to offer their email address to provide a way for readers to communicate with them directly. however, in posting your email address on your blog, you will run the risk of your address being harvested by spam-bots, which scan the web in a similar fashion to search-engines, though specifically targeting email addresses to add to their databases. Another foolproof method to protect your email address is to include your email on an image, such as this: This method ensures that your email address is only readable by humans, but adds the extra step that readers must type your email address, rather than simply click a link to their email client. These methods will all help to protect your email from malicious spammers when posting your email address on your blog. Do be aware that your email can also be harvested from comments, message boards and forums if you post your email address as normal, so be sure to disguise your email wherever you decide to post it! Go to Template>Layout in your Blogger Dashboard. Give your widget a title if you like (eg: "Search this Blog"), and click save. You should now have a fully functional search box in your blog's sidebar! So, if you prefer something simpler than the Google blog search I wrote about before, this is surely the widget for you. I've been contacted by CollegeScholarships.org to help promote their excellent web-design scholarship contest, which is open to all US citizens attending full-time, post-secondary education. The winner of this contest will win a scholarship to the value of $5,000! Although BloggerBuster typically features help for Blogger, I thought it would be good to post about this competition for those familiar with WordPress templates to have their chance at winning this great prize! The design needs to be a WordPress template, which should be uploaded to your webspace before submitting the URL and your details using the form found on the CollegeScholarships website. The closing date for submissions is August 13th 2007, so act soon if you want to give the competition a try! Winners will be announced on the 20th of August on the site. Hello everyone! I'm back from my holiday now, and unfortunately it seems that some of my pre-written posts haven't been posted (an error from my email service, I'm sure), so I do apologise for the lack of new material this week. The Blogger's TOS page makes no reference to navbar while Google representatives in the Blogger support group (nickname: Blogger Employee) have always ignored discussion threads seeking an official stand on hiding navbar. There's some hope now. Google recently organized a road show in select Indian cities to promote their Blogger platform. Ankit attended the event and requested clarity on the navbar policy from the Googlers present at the roadshow. They immediately called up their team based in Google's Bangalore office and confirmed to Ankit that it's legal to hide the navbar. Go to Template>Edit HTML in your Blogger dashboard and first back-up your template to ensure you can restore it if you make unwanted mistakes! You can preview your template to see the effect in action, and then save your template to save the changes for good. (Thanks to Testing Blogger Beta for this hack!). I don't include this hack in my blog since I actually find the navbar rather useful (especially when editing my blog) but I can understand why others would want to implement it. As yet, I haven't been able to find clear clarification about hiding the nav-bar from Google/Blogger, so if you do use this hack, please be aware of possible implications! You've probably noticed the "expandable posts" feature in my blog. Well, the creator of this great hack has now come up with an even better alternative: Peekaboo posts" with a fade-in fade-out effect! This really does look great on a blog: the post expands and retracts within the same window by fading in and out slowly. For full details and to get the script to install in your blog template, pop on over to Hackosphere's blog. Help! My new blog template/add-on/hack stopped working! If you find that your third party template/images/script suddenly stops working on your blog, it may well be that the owner/author's hosting service has exceeded the allotted bandwidth, or perhaps that they have simply removed the file altogether! Recently, Hackosphere suffered from bandwidth suspension after his host received far more traffic than was expected. Unfortunately for users of his scripts, this made their hacks and templates stop working! In order to avoid this, it's always a good idea to download all images/CSS files/Scripts you use from third parties and upload them to your own hosting provider, then alter the link in your template to reflect the change. While I try to ensure all template and image files used in my Blogger templates are hosted on a server which can accept a great amount of traffic, I do still appreciate it when users upload template images to their own image hosts. ...amongst other free providers. Other files may be hosted for free at Google Pages. Three column layout with two sidebars on the right. Cross column section across the sidebars for AdSense, blog description, label cloud, etc. User variables for font, colours, etc. You can see the Sunset template in action here. The download for this template features the XML template itself, plus a help file and all images which you can then upload to your own image host. You are free to modify the template to suit your needs, but please leave the author credits intact. Please do not distribute this template without a link to the author. 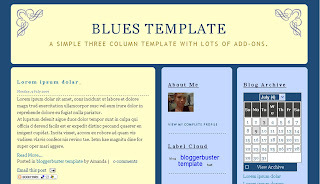 You can find more three column Blogger templates here. One of the few things I'd hope to see in the new Blogger format was the ability to schedule posts to appear at a later date. Unfortunately, this hasn't (yet) been implemented in Blogger, so unlike Wordpress users, we can't schedule our posts. Firstly, you should set up your "Mail-To-Blogger" address in your Blogger dashboard if you haven't already done so. To do this, go to Settings>Email in your dashboard, and create a unique email address to send your email posts to. Ensure you keep this address as secret as you would a password, since anyone could use this to post to your blog if discovered! Ensure you have checked the "Publish" box and then save your settings. Letter me Later: Features the ability to write emails using your existing email address! Has an HTML editor, no advertisements, and a quick send client for ease of use. Free registration required for all features. Email Scheduler: free service featuring unlimited storage, reminders and optional toolbar. Once you have set-up an email scheduling service, you can write emails as you would your Blogger posts. The subject line will become the title of your blog posts, and if you use an html editor to compose your emails, you will have the same functionality as your Blogger "compose" function. Ensure you schedule the exact time and date you want to send the email before hitting send as this will be the exact time your post is published, and send to the email address you set up in your Mail-to-Blogger settings. The only disadvantage of emailing your posts is that you cannot define labels for your posts before sending them. If anyone has discovered a way to do this, I would be very glad to hear from you! Of course, you could edit your posts at a later date from your Dashboard to add the labels. This method of scheduling Blogger posts is something I will be using for the next week or so, since I'll be on holiday and unable to post as usual! Please feel free to leave your comments below. If anyone knows of other free email scheduling services, please post them here and I will edit this post to include them. After uploading the "Sweet Dreams" template, I was asked how to embed background music in a blog. It's actually quite simple to do this, and there are various methods you can use. where the URL is that of the background music you wish to use. This method works perfectly well, but visitors to your site will not be able to switch the music off if it becomes distracting. loop: set to "true" to have the music play over and over, or "false" so that it plays only once. height: if this is set to "40", only the play options will be visible. You can make this larger if you prefer, in which case blank space will be visible. Using either method, you can link to .mp3, .mid or .wav music files. However, you must be aware of copyright restrictions, and ensure you have the appropriate permission for use for the music you decide to use! MonkeyFilter Wiki: contains links to many sites offering free music downloads. In this tutorial, I'll explain how to create a three column template in Blogger layouts, using the Minima template as a starting point. The Minima template is the easiest Blogger template to customise, as this is the simplest two column template, and has few parameters regarding margins, padding and the like. Once you have developed the third column, it will then be easier to alter font-size, colours and such so leave this until later on. We're going to concentrate on the actual layout first. Go to Template>Edit HTML, leaving the "Expand widget templates" box unchecked. This will provide the styling for the new sidebar element which we will create next. <div id='left-sidebar-wrapper'> This section tells the browser that the left-sidebar element exists here, and to look in the css for the appropriate styling for this element. <b:section class='sidebar' id='left-sidebar' preferred='yes'> This tells the browser the class of the sidebar element and all other elements (widgets) which may be included in this section. The ID of this element must be "left-sidebar" in order to make it unique, otherwie this would cause problems when viewing. It is preferred so that it will feature in the layout, even if no widgets are placed within it. We need to increase the width of the wrapper by the width of the left-sidebar-wrapper, in this case 220px. So, change the value in red to 880px. At this point, you should save your template. At present, your new sidebar will not be seen as there are no widgets contained within it, though it will still be present in the markup of the page. Once you have saved your template, go to Template>Page elements in your Blogger dashboard. Your layouts section should now look something like this: You can now add a page element (or two) to your new left sidebar. Finally, save your template and enjoy your new sidebar! The same principles described here can help you create a three column template from any Blogger template, though you may find that you'll need to adjust the width, margins and padding for your new sidebar in order for it to look the way you would like. Also, you can configure your new sidebar to float to the right, and have two sidebars on the right of the main column if you prefer. Simply set the CSS of your new sidebar to float: right; instead. For more Blogger templates to download, please have a look through the Templates section here at Blogger Buster. ...though I have to say that the screenshot doesn't do the template justice! If you use this template, I would appreciate a link back to Blogger Buster somewhere in your blog. Please do not redistribute this template without including details of the author. In the near future, I will also create a three-column template of this theme. In the meantime, please leave your comments and opinions below. A "favicon" is the icon which appears in the left of your address bar and in your "favorites" menu in your Internet program. I've just added a favicon to my blog, which you should be able to see in the address bar above (Internet explorer users must have Blogger Buster bookmarked before the icon can be seen, as I will explain later). To have a favicon for your own blog, you'll first need to create an icon which is 16x16 pixels in size, and save this as a .ico file to your computer. I used Gimp to create my favicon (which is a free program with most of the functionality of Photoshop), though you could also use paint or any other graphics creation program. Once you have your favicon, you'll need to upload this to a hosting account. If you already have a hosting account somewhere, you can upload it there. Free image hosting for ico files is available at Ripway (30gb space), and also at MyFavatar (registration required). Be sure to make a note of the exact URL of your favicon when you upload it! The easiest way to do this is to search for </head> in your template HTML and insert the code just before this tag. 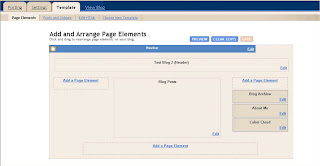 Now save your template and view your blog. You should now see your favicon appear in the address bar! If you are using Internet Explorer, you will need to bookmark your blog before the icon will be seen. You may also need to refresh the page/close the window before your icon will appear (a rather unfortunate glitch in IE, and yet another reason to recommend Firefox!). But be assured that it will appear! Also, when you bookmark your blog (or indeed any other website featuring a favicon), the icon will appear in your favorites list beside the site title. Having a favicon for your blog enhances your blog's branding and identity, and is also quite fun! If you have created a favicon which you would like to share, please let me know as I will shortly be posting a set of favicons here for free download. Today I discovered an excellent hack over at Beautiful Beta: a widget which enables you to automatically show a table of contents for all of your blog posts! I've now added this to my template so you can easily access all of the posts here, and sort them by title, post date or label. Simply click on the "Show table of contents" link near the top of my right sidebar. Hans' hack is remarkably easy to implement into your blog, since he has provided the code ready for you to copy and paste into the relevant sections. In order to use the Table of Contents widget, you will need to alter your template slightly so you can add a page element to the top of your blog posts. This is so the table of contents can expand into this area, leaving your posts in place beneath. After this, it's a simple case of copying and pasting code into HTML page elements in this new section, and also in a sidebar widget.Use this link to read Hans' post featuring the code and implementation of this great Blogger hack. This widget can also be customised using CSS to alter the styling, which you would insert between the <b:skin> and </b:skin> tags near the top of your blog template (I will be doing this to my own CSS section shortly!). This hack really is a great way to organise your blog posts in order to make it easier for readers to find posts they are interested in. Email subscriptions enable your readers to receive your posts by email, and can be a great tool for helping develop a regular readership to your blog. 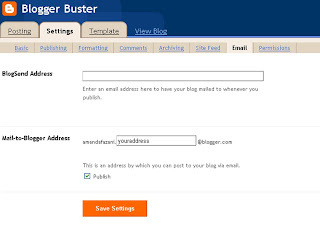 Visit Feedburner.com and insert your blog URL into the box, then click "next". On the next screen, select the feed you would like to offer subscriptions for. The default for Blogger is Atom, which you can customise to be long (full post), short (first paragraph) or simply headlines in your Blogger dashboard. Once you've chosen the feed you would like to publicise, you can then edit the title of the feed and the URL where it can be located. Then create your free account with Feedburner (or sign in if you already have an account) and click "Activate feed". Now, your feeds will also be publicised by Feedburner and you should be able to log in to your Feedburner dashboard. So let's create your email subscription box! Click on the feed title for your blog, and then the "Publicize" tab at the top of your dashboard. Look for the "Email subscriptions" link in the left column and click this. Choose the language you would like to use to publicise your feed. If you are using New Blogger (layouts templates), you can easily insert an email subscription widget into your blog sidebar. Find the "Use as a widget in..." section and choose "Blogger". You will then be directed to your Blogger dashboard to confirm insertion of this widget and rearrange its location in your layout. If you are using Classic Blogger templates, you should copy the code section and paste this where you would like the email subscription box to appear in your blog. Once you have set up your email subscription box, you can customise the look by opening the widget in Layouts. You can alter the text, font and even the alignment to suit your tastes. You can choose further options from Feedburner's service through your Feedburner dashboard, such as notification by email when someone subscribes/unsubscribes to your feed, track clickthroughs, etc. Feedburner also supply feed subscription buttons which you can use to publicise your blog feed for subscribers to read in a feed reader. Blogger Templates have a great "recent comments" widget available which you can use to display recent comments in blog. You can see an example of this in my right sidebar. To use this widget in your blog, head over to Blogger Templates and choose your options, including the Blog*Spot url of your blog. Click "apply" then "Add widget to my blog". You will then be taken to your Blogger dashboard where you can automatically insert this widget into your Blogger layout. You need to change only the red section of the URL to your custom domain URL (eg: http://www.yourblog.com). Click save and you should then see your recent comments appear. For instructions on uploading this template to your blog, please read this post. You can also preview the Blues template in action here. I'm also developing a few more Blogger templates to download which I'll post as soon as they are ready. Please leave your comments and opinions below. If your blog's web address has changed, or if you are using Blogger's custom domain service, you may have need of a redirect page for your blog. A redirect page stays at the location of your old blog (or at the http://yourblog.com address if you are using a Blogger custom domain) and automatically redirects users to your blog's true address. Copy the whole text in the box below and paste into a simple text editor such as Notepad. Change the text in red to reflect your true blog address, and the text in blue to something which better suits your needs. The "8" means that the browser will wait 8 seconds before redirecting to your true blog address, just enough time for the visitor to read the text and understand the reason for the redirection. You can change this to "0" instead, which means that the redirect would be immediate, and the visitor would be unaware of the change in web address unless they look at the address bar. However, it is good practice to have at least the URL of your true blog address in the body of the page as some older browsers do not recognise the redirect function and would be unaware that your blog is not hosted here. Now, save this file to your computer with the file name "index.html". It is very important that you name it such, as this needs to be the page which loads when a visitor types http://yourblog.com into their web browser.You can preview this in your own browser to check the page looks okay, and you should be redirected to your true online blog address within the time you specified in the meta section. Now, you need to upload this to the root of the folder where visitors would visit your blog. If you have purchased a custom domain for your Blogger blog, for example, you would upload this to the root of your hosting account. If you are uploading to a previously used sub domain at http://blog.yoursite.com this may be the root of the folder named "/blog/". Go online to your redirect page address (eg: http://yourblog.com/index.html) and check that the redirection works. Then all you have to relax and know your visitors will be able to find you! If you have purchased a custom domain for use with a Blogger blog, you should find that your domain provider will provide at least enough room for a single web page, which you can use to upload your redirect page. I use GoDaddy for domains, as this company provides free hosting, personal email address and other features of great use to Bloggers. (Just in case you're wondering, I don't get paid to recommend GoDaddy; but of all the domain providers I've ever used, this company is simply the best value I've found!). If you have any problems setting up your redirect page, feel free to contact me directly for more detailed help. Tell Blogger which features you would like to use! If there is a feature you would particularly like to use in the Blogger platform, you can vote for it in the Blogger Wish List! Just select the feature you would most like to see and submit your vote. Alternatively, you can suggest a new feature of your own. For me, Blogger enabled trackbacks would be a great feature to include. What's on your Blogger wish list? Head on over to ZoomClouds and create your free account. This will allow you to use the tag cloud service and store your designs on site. Now it's time to create your first tag cloud! Sign in to your ZoomClouds account and click on "create cloud|" near the top of the page. Give your cloud a name and description, and submit your RSS or Atom feed. For Bloggers this will either be "/feeds/posts/default?alt=rss" or /atom.xml" at the end of your blog address (eg: http://yourblog.blogspot.com/feeds/posts/default?alt=rss). Select how many days worth of content you want to include in your cloud. The maximum will depend on how many posts are included in your feed, so you may want to consider changing your feed settings if you want to include all of your posts in the tag cloud. Click "create cloud" to create your cloud based on these settings. You can then view your cloud with the default ZoomClouds design to see how it can look. To change the appearance of your cloud, click on "design" near the top of the screen and choose your settings, including border colour, fonts and more. You can save multiple templates of the same cloud here too. To get the code for your cloud, click on "design" and scroll down the page a little until you see the code box. Select all of the code (Ctrl+A) and copy to your clipboard. 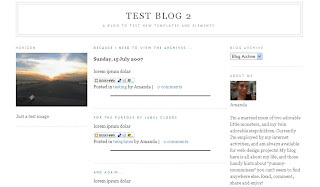 You can then insert this into your blog template where you would like it to be displayed. If there are tags in your cloud which you would prefer to be left out, you can choose this by clicking on "Filters" near the top of your ZoomClouds dashboard and adding each unwanted tag in the box supplied. Similarly, you can also add tags that you want to be included in the cloud which aren't yet featured. Tag clouds could be used instead of label tags in your blog, or indeed as well as labels, since they are a reflection of your post content, rather than the labels you give to your posts. Example usage would be in a sidebar widget, though you may also want to consider featuring one at the top of your posts (see this post for a tutorial), or even in a blog post as I have done here! You could use a banner like this to advertise your blog on other sites, or even to draw attention to pages on your blog. To create your animated banner, head over to AnimationOnline and choose your design. Key in your titles and text, and click "make banner". You can then right click your animated banner to save to your PC. In order to display your banner properly in your blog, you'll need to link to host the image elsewhere and link to it using HTML code. Photobucket and Imageshack provide free image hosting if you don't already have a hosting account elsewhere. Don't try to host your animated gif at Blogger, as the image will be static! Make a note of the web address your image is hosted at as you'll need this soon. Don't forget to substitute the address with that of your hosted image! Don't forget to substitute your own blog address! I'd love to hear about any other free animated banner services, so if you know of any please leave your link (and comments, of course) below.